Got a letter from "Deke" DINSMORE with a newspaper clipping in it with a note on it, to wit: " Jack Swonson may be too modest to let you know of his great promotion.". The clipping states that Jack has been appointed as head of USAAs groundbreaking Western Operations Center being built in Phoenix. Jack was Senior Vice President of Retail Banking with USAA Federal Savings Bank. He will now become the Senior Vice President of the Phoenix Operations Center. "The Center will - when completed  rival the San Antonio headquarters in its size. Under Swonsons direction, USAA Federal Savings Bank significantly increased its residential mortgage and home equity loans. Home lending is now 10 times larger in volume than when he took over in 1988...Swonson will gradually transition out of his banking duties to become the "base commander" who oversees day-to-day physical operations of the western sector on 575 acres in North Phoenix." Congratulations, Jack, on the promotion. Keep us updated on progress of the new center and your familys happenings. Got a letter from Stan and Mary Anne PATRIE. "Please pardon the delay in sending the photo and a very special thank you for arranging the lunch. It was so nice to be able to see the group and to get caught up on each others lives. Our trip to Florida turned to be so much more than we expected." 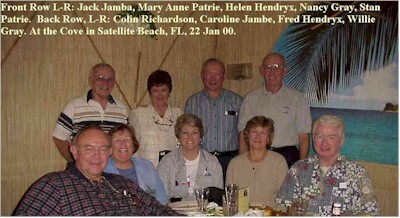 In the front row, L-R, are: Jack Jamba, Mary Anne Patrie, Helen Hendryx, Nancy Gray, and Stan Patrie. In the back row, L-R, are Colin Richardson, Caroline Jamba, Fred Hendryx and Willie Gray. The photo was taken in Gilligans Cove Restaurant in Satellite Beach earlier this year. Stan and Mary Anne were on their way home and stopped by to see the local Redtags in the Satellite Beach area. On another trip, the Patries stopped by Ft Walton Beach and visited with some fellow Redtags and wives. In the photo, L-R are: Stan and Mary Anne Patrie, Allen and Alfie Jackson, and Randy and Lieu Schamberger. They enjoyed an evening of fun and decadent revelry as the picture so clearly shows. They didnt even try to hide the beer bottle or the two frothy cocktails. Notice most of the empty glasses and bottles are in front of Mary Anne, which explains her great smile. I have a few pictures from Fred Hendryx wedding last year that I havent published yet. Shown in the picture is that fireball of the party himself, Carl Bolster, sleeping on the couch while Colin Richardson, Tom Young and Jim Gallagher get ready to tag him. That was a fun wedding. Im still looking for a picture of Fred being thrown in the pool. I copied an email from Randy Schamberger to Ron Poole 63, who was trying to locate one of the men who started with the Redtags. "Are you talking about Darwin Edwards? I ran into him about 15-20 years ago at some kind of meeting. Can't remember where or when,but he recognized my name on a roster. We were in 12th Squadron doolie year. (As I recall, he had some Army enlisted time before he came to the Academy). I was a USAF exchange officer with the Army at the time and I think he was working as a civilian at one of their labs. I attended meetings at many army bases, since I was involved with Chemical Protection and Chemical weapons. It could have been at Ft. Sill at the Army Artillery School. I'm at the age where remembering who I met last week is becoming a challenge, so don't quote me on my recollections." Sorry about quoting you Randy, but Im out of articles for this column. I didnt get very much input so Im scraping the internet files. Heard from Al Jackson that if you have your Cadet DD214 in addition to your regular DD214, you get an extra $10 per month for your Social Security payments. Keep that in mind. As Randy says: " Thats enough for an extra carton of tennis balls." On a personal note, Ill complete my year as the Toastmasters District 47 Governor for almost the entire state of Florida and the Bahamas on June 30. Then I wont have to stay up nightly until midnight to keep up with the administrative traffic. Ive met a lot of people and gotten to know the State of Florida much more intimately. I have also improved my public speaking skills. Until next issue, stay healthy and wealthy and wise. And dont forget to send me updates to fill up the next column. Remember that you should be sending me your inputs within a few days after reading this column. Dont delay. Send today.